From an early age, children should learn that misbehaviors can bring unwanted consequences. Hitting siblings can mean time away from the center of the action, not finishing homework means a loss of TV time, piles of dirty laundry in their room means favorite clothes aren’t clean when they want to wear them. These consequences are appropriate because they fit the behavior. 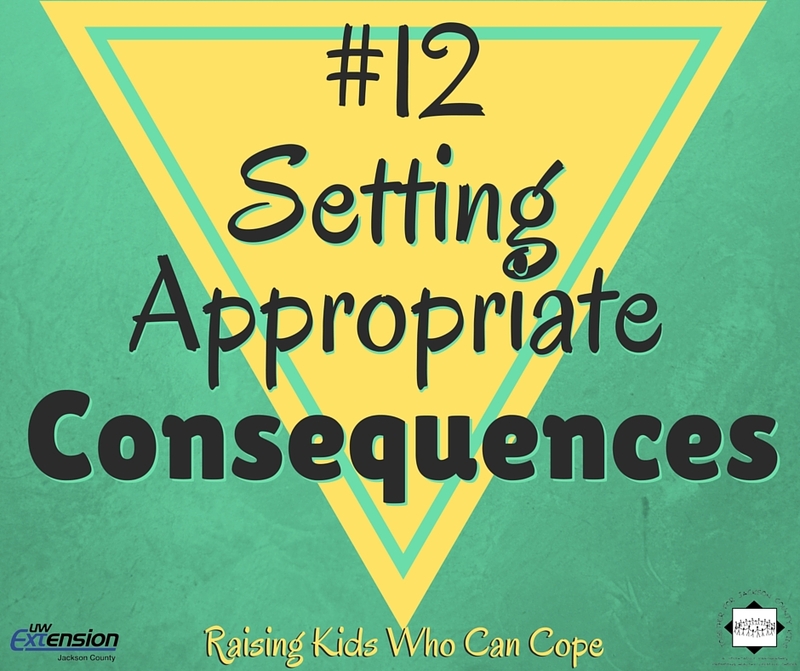 A consequence that is too stiff or unrelated to the behavior takes focus off the behavior you want to correct and makes the child defensive. They come back with “You never let me have any fun” or “That’s not fair” and the conversation becomes a tug-of-war with words. The situation becomes harder to resolve. When parents apply appropriate consequences, children can learn lessons of responsibility and problem solving. This becomes especially important with teenagers, the consequences of decisions can become much more serious than not cleaning a room. To avoid spiraling negative cycles, make it clear from the beginning that certain behaviors are not negotiable and consequences are immediate. Also, remember that in growing up, children of all ages can benefit from being involved with parents in negotiating boundaries and developing decision-making skills. Ginsberg, K. R. (2011). Building Resiliency in Children and Teens. Grove Village IL: American Academy of Pediatrics. This entry was posted in Raising Kids Who Can Cope and tagged coping skills, discipline, youth. Bookmark the permalink.